The wood-grouse is an ancient, relic bird. The male is often called a crook or chukhar . The weight of some individuals reaches up to 7 kg. The female is called pied or copula, she is much smaller than the male. It is difficult to confuse a huge black and gray rooster with red eyebrows (man is always handsome) with inconspicuous motley. Only the crooks talk , and the young wood-grouse often keep silent. The current is the place where the “action” itself takes place. The current has the same place from year to year and so can last for a very long time if it is not disturbed by a person or natural elements, for example, a forest fire. The current is most often located in a deep place, or in a clearing surrounded by trees, or in a rare forest where there is no undergrowth, on the edge of a moss bog. Hence the second name is a crook . Find a capercaillie talk – great luck. Only here to chat about its location is not worth it, otherwise you can be left without a treasured trophy. Grouse begin to gather on the current in March . Here at this time it is not difficult to determine. The bird feeds right there, eating pine or juniper needles. On the snow are characteristic prints of footprints and flourishes on their sides left by lowered wings. 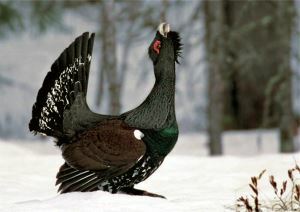 During this period, already at dawn, you can hear the call-up “song” of wood grouses. But the very height of singing begins in April or early May , depending on the region and the weather. A large current can consist of up to fifty birds and occupy a large area. But most often there are current up to a dozen grouse. We did not have to look for the location of the current, as my comrades had been at this place for years. After 30 km on the UAZ along the shaking forest roads, we walked another 5 km, after which we found ourselves. Immediately make a reservation that we left in advance in order to conduct reconnaissance on the ground during daylight. Outing showed that the current is valid. We have planned the paths of approaching the current , since it was to be approached in the dark. And at night, any branch that fell under the foot could make enough noise to scare this small current. After that, we went back 400 meters, where we settled for a short rest. After a thorough briefing, shortly before dawn, we moved towards the current. Meters for 150 stopped. After a short wait, they heard the song of the grouse. Experts call this process of waiting the eavesdropping . Yeah, weakly this song is like a serenade. The song of a crook consists of two parts , between them a bird makes a sound similar to the sound of a cork being pulled out of a bottle. The first part, longer, resembles clicking a fingernail across a matchbox. The second part lasts only 2-3 seconds. I would compare the sound with the sound that is obtained at the point of the knife on the bar. It is at this moment that the grouse loses hearing. Scientists claim that some are formed during the current of the tumor, which at the time of the second part of the “serenade” cover the bird’s ears. But we are not theorists, but practitioners. Therefore, during the short-term deafness of the crook, they had time to take 2-4 steps and again faded. The approach to the current bird must be very careful . Hearing hearing, but his sight does not refuse. Therefore, we approached, hiding behind the trees. The process, frankly, is one. Your heart is pounding, adrenaline rolls over, it seems that your breath is heard for a kilometer. The wood grouse at this time walked along the branch, turned from side to side and sang with short breaks. Even after dark came the motley rushes, which was perfectly audible by the flapping of the wings. They also sat down on the branches of trees and occasionally published an indistinct mutter (again, handsome man!). It seemed to me that we were approaching the grouse for an infinitely long time. Sometimes it seemed that the sound of a song came from all sides. But this is because the wood-grouse walked along the branch and turned in different directions. But here I was able to clearly see the capercaillie on a pine branch. Remembering the instructions, I waited for the second part of the song , raised my gun and took aim. With the next second part, I shot at the side of the crook. With shaking hands, he approached the fallen bird. The trophy was taken. Shoot with a temporary deafness of the bird should be because in the event of a miss, he will not hear the shot and the hunter will have a second chance. 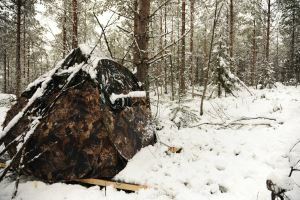 Shooting to the side is necessary because the capercaillie will not fly away with a broken wing, whereas a shot in the chest does not guarantee that the bird will not fly away and will not die in the forest more often. We spent the next short northern night in Skradka. Friends made it for a long time, it organically fit into the surrounding territory and did not alarm grouse. The first songs were heard late in the evening, but they were lethargic and inactive, unlike dawn. Therefore, to approach the current grouse better at dawn . Arrived at the call motley sat on the branches. The crooks, who noticed them, flew up to them and went down to the ground, continuing to flow. It turned out that motley is 2 pieces less than roosters. Began the most interesting . This can be called fighting without rules. The roosters went to the sides, then knocked again so that only the feathers flew. The battle between several wood-grouse (it was difficult to count correctly, since they were often mixed, and all on one “face”) lasted about 15 minutes, until one of the roosters was at a distance of a confident shot . The partner did not miss. The current is instantly empty. What else was interesting to learn? The current begin oldest grouse . Young join later. It is not worse if you start approaching a young male who has flown in not so much current, how much to look at. He does not sing, so scaring him off at the approach is very simple. It is also called silent . The current is very influenced by the weather . If it is cold, cloudy, damp, precipitation, then wood grouses can simply gather, sit, and the current will not start. Best of all they talk in good warm weather. The first part of the song, after voicing, can be silent. This case is called haul . If this happens, do not interfere with the decoy , which makes the sound of a female. The wood-grouse, most often, having heard him, will continue his call. We were without semolina, so I can not say whether this is so. Some hunters use a night vision device , which makes it possible to detect the capercaillie at an earlier stage of the approach. I learned that there are white-bellied grouse, dark taiga and black-bellied. It depends on the habitat. The most interesting is the wood grouse (the name makes clear the habitat). His songs are very different from the rest, and he does not stall during his serenade. It is smaller than usual and has a bluish black color. Comrades, too, did not ever hunt for such a game, and we wondered for a long time how was it approached during the hunt? For hunting wood-grouse there are certain requirements for weapons . First of all it is 12 gauge. It is hardly worth pulling a semiautomatic device with you, and a conventional double-barrels is enough. The main thing is that the battle of the gun should be heaped and sharp. Hence the requirements for the patrons . Be sure to fraction number number 0-1, not less, a portion of gunpowder – 36 grams or more, a container. Shooting from a distance of no more than 40 meters. Clothing should be warm, light, not constraining movement. Moreover, it should not rustle very much, since the grouse is a very cautious bird, it is easy to frighten it away with extraneous sounds. Fine, if you put on thermal underwear, believe me, the thing is irreplaceable. It is necessary to have a set of spare clothes and socks with you. And finally. Excellent, excellent trophy spring wood grouse. But the taste leaves much to be desired. Affects winter food needles, its meat often has its taste. But not for the sake of meat, hunters climb in the spring who knows what kind of jungle, looking for a capercaillie current.